During the 18th and early 19th centuries smuggling was carried on extensively along these coasts and Lee was an ideal location. Its sheltered cove is accessible only through a small channel between rugged rocks, while the valley itself is cut off from the rest of the world by steep hills, honeycombed with a network of paths leading to isolated farms. One of the most notorious smugglers known to have operated from Lee was Hannibal Richards. Six foot tall, with long black hair, he and his five-foot wife moved here in 1789 from Morwenstow in Cornwall, where he had been one of the Cruel Coppinger’s gang of smugglers. Hannibal Richards lived at The Gwythers, then a farm, but soon returned to his old ways. He was well-known to the Collector and his name appears in, several reports but he seems never to have been convicted. Nevertheless he had several close shaves with the coastguard and revenue. After a raid in which he was the only one of his gang to escape he decided to retire. He died in 1849 at the age of 85. He and other members of his family are buried in the churchyard at Ilfracombe. Smuggled goods were carried into the interior, stored in outhouses or cellars. Records from the late 18th and early 19th centuries refer to landings of brandy and gin, red Portugal wine, salt, tea and even playing cards. Many people saw smuggling as a way of making life more comfortable under the extremely harsh laws of the time and often the whole community would be involved, but it was often a far more brutal business than today’s romantic images suggest. 1. (Optional 1/2 hour detour to Hannibal Richard’s look-out above Sandy Cove). 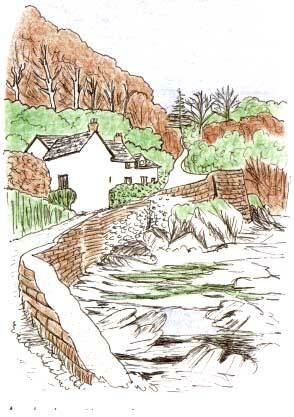 Starting from the car park near the sea front, come out onto the road and turn left past the Smugglers Cottage. The road rises steeply above the cove and bends round to the left. 2. (Optional) Go in through the small gate on the right leading to the Coastal footpath across the NT land of Damage Cliffs. Follow this path uphill and then take the lower, right-hand path which runs close to the cliff edge. Continue downhill to a stile in the fence on the right. A steep flight of steps leads down to Sandy Cove. Retrace your steps to the car park. (At low tide it is possible to return over the rocks to Lee Bay, but beware of incoming tides which can quickly cut you off). 3. Take the road between the cove and the car park and follow it round to the right between The Old Mill and The Lee Bay Hotel. Continue along the valley and into the heart of Lee village. 4. At The Old Post Office bear left, passing The Old Maids Cottage, The Fuchsia Tea Gardens and former Lee Post Office, now holiday accommodation. (which was once the New lnn run by Hannibal Richard’s son, Martin). 5. Continue up through the village, past the Old Schoolroom, Lee Memorial Hall and St Matthew’s Church, following the road as it winds further up into the valley. 6. At the junction with the Coast Path turn left past The School House and follow the lane uphill until you reach a stile. Cross this and a second stile and carry straight on up through the field. This stretch can be muddy but there are glorious views. 7. Where the path joins the Old Coast Road turn left and walk downhill towards Lee Bay. The lane runs between steep banks and hedges affording glimpses of the rugged coastline nibbled with coves and the steep wooded hills across the valley. 8. Keep straight on downhill past the old Coastguard’s cottage. Follow the lane round to the junction opposite the Lee Bay Hotel and turn right, walking back past the cove to rejoin the car park. A cave in a cove where Hannibal Richards had his look-out. A farm which became an inn where Hannibal Richards lived. 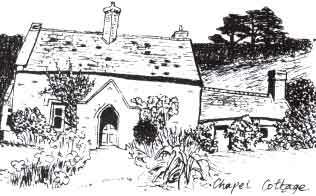 A chapel which became a cowshed where he hid his contraband. A cottage serving tea and smuggling stories. A church with a memorial to a smuggler’s son. A former post-office, once an inn run by a smuggler’s son. A cottage where the coastguard kept a look-out. How many paths, lanes and other inland routes of escape can you count? There is a listed building on the edge of the shore which is reputed to be a smuggler’s cottage and it bears the date 1627.This cottage originally belonged to the Cutliffe family of Damage Barton. In the 19th century it was sold along with the Old Manor which later became the Lee Bay Hotel. At the turn of the century the cottage was called the Beachside Tea House and all the water had to be brought down from a spring. In 1946 it was sold again and the new owner ran it as a seaside business complete with wrecking and smuggling stories. It has been a private house or a tea garden ever since. Sandy Cove lies just to the west of Lee Bay and is accessible at low tide over the rocks and at any time by footpath from Damage Cliffs. It used to be possible to slip through a narrow opening into a small cave above the cove. It is here that Hannibal Richards was said to have his look-out and from where he was the only one to escape when his gang were raided by the Revenue Men. Pilots used to wait on Sandy Cove for vessels to appear. Initials carved in the rocks date from the 1830s. Built by and named after Charles Gwythers, this was originally a farm. In 1789 Hannibal Richards came to live here and for many years it was the village inn, no doubt supplied by much of the proceeds from Hannibal’s smuggling exploits. Its secluded position, proximity to the cove, and ready access to a network of hidden tracks and footpaths must have made it an ideal base for this notorious smuggler. The church was consecrated in 1835 and is a small Victorian building in the neo-gothic style. Martin Richards, son of the notorious smuggler, was the first Parish Clerk. The Richards memorial is in the wall of the nave. The coastguard service came into being largely in response to the problem of smuggling. In 1800 the Collector for the Ilfracombe area named Lee Bay as a place needing extra staff. In 1801 a riding officer was appointed for the coastal stretch including Lee and a condition of his employment was that he should live “in or near Lee Bay”. Photographs taken at the turn of the century show the old Coastguard as one of the cottages on the eastern headland above Lee Bay, probably either Drummets or the Fisherman’s Cottage. This and other outlying farms and cottages are known to have been used as hiding places for smuggled goods. Whitestone lies about 1 mile out of Lee, at the top of the hill on the road to Ilfracombe. A report in the “llfracombe Chronicle” of 1873 refers to the year 1813 when “In a farmyard of the village of Whitestone formerly stood some sheds, which at the time we are speaking of used to have cellars, which even to a careful observer would remain unnoticed … well stored with barrels of smuggled spirit brought in from Lee”. Another report also in 1873 refers to the discovery of two brandy caves beneath a house in Lee which was undergoing repair. In one of the caves a spirit measure was found. Some time after Hannibal Richards’ death in 1849, his son Martin transferred the village inn from The Gwythers to this building where it was known as The New Inn. Another owner took over in about 1880 and at there are’ accounts of the beer being fetched in barrels by horse and cart from Mortehoe. 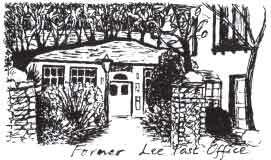 The inn was still operating into the early years of this century when it became the village post office, replacing what is still known as The Old Post Office. In 1994 this Post Office was closed and business has been transferred to the Grampus Public House.